Mekong Delta has had an interiacing system of canals and rivers, and has been known as the land of "Nine Dragons" with overflowing tides, with low water exposing the alluvium, and with living boats commuting on the rivers everyday.... River is a characteristic feature of the western region, the land of hundreds of rivers, estuaries interwoven like the cobwebs. There are rivers, canals, water transport means; there are people living, buying and selling, exchanging products on the boats…., people call it “the floating market”. In addition to Nga Bay (Hau Giang), Nga Nam (Soc Trang), and Cai Rang (Can Tho) floating markets, there are other unique floating markets in this well- off land. Cai Be floating market is located on Cai Be district, Tien Giang, in Tan Phong isle on Tien River bordering three provinces of Tien Giang, Vinh Long and Ben Tre. The market is not only the place of trading and exchanging products, and the transshipment point where fruits and yields are delivered to other regions, but also the fascinating destination of Tien Giang province. Unlike the normal floating markets which are only held in the morning, Cai Be floating market is opened up from early morning until late at night. 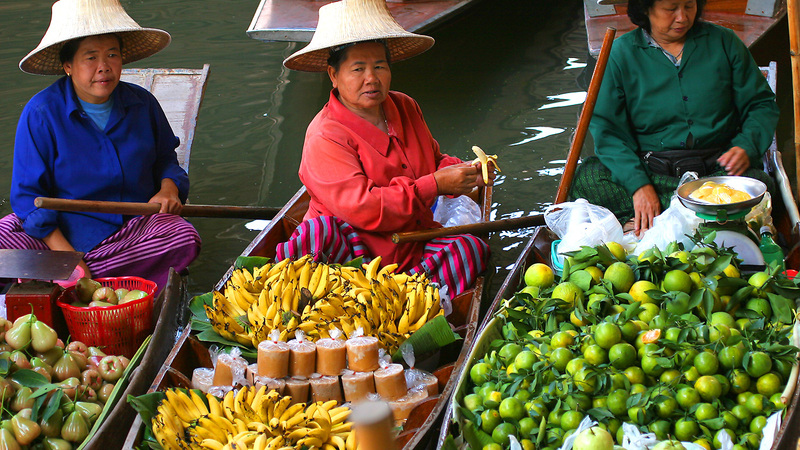 When the sun rises, the floating market is as bustling as a small town on the river. The canoe peddlers like pho, noodles, groceries ... wriggle through the others creating a lively scenery. Sitting on a boat, enjoying a bowl of noodles or a fragrant cup of coffee in the morning is an ineffable experience. When the sun sets behind the distant trees, it is also time when the "floating city" lights up, the shimmering lights are silhouetted against the river and make it become lively and colorful. Visiting Cai Be floating market, visitors will surely feel the novelty of the western river region. 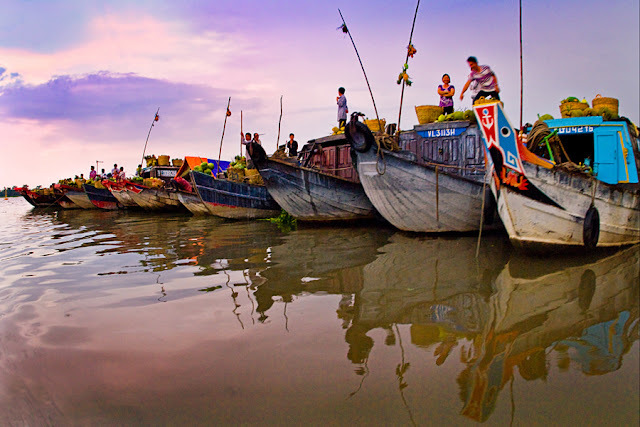 Long Xuyen floating market is not as large as other markets, but it is a tourist sight that tourists should visit in the floating market tour to discover the idyllic, tranquil and pristine beauty of local people and river. This market is about 2 km far from Long Xuyen city, and is situated along one side of the Hau river with fertile alluvium. Tra On is the last floating markets located on the Hau river of Tra On District, Vinh Long Province. This is one of the oldest markets existing and associating with many cultural activities of people in the region. A special feature of Tra On floating market is that it is held with the tide. Tra On market is busy in the morning, but it is even more crowded when the tide is hide; the higher the tide is, the more crowded the boats will be. Therefore, visitors can easily explore this market at any period of the day. Coming to Tra On floating market, visitors should not miss the famous food specialty which is beef noodle served with banana inflorescense, and listen to the sweet songs named “Tinh anh ban chieu” (love of the mat seller), “Da co hoai lang” (missing husband at night) in the homeland of the famous artists- Ut Tra On.